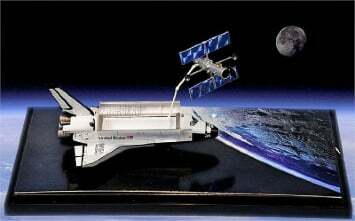 The famous NASA Hubble Space Telescope (HST) and the Space Shuttle Discovery. This space shuttle blasted off from the Kennedy Space Center on 11 February 1997 on STS-82, a servicing mission. The HST, this vital space-probing piece of astronomical equipment, underwent servicing by crewmen of the Discovery. This was the second servicing mission for this high-tech telescope that was placed in orbit in 1990. The maintenance significantly upgraded the HST’s capabilities with new apparatus like the new Space Telescope Imaging Spectrograph (STIS) and Near Infrared Camera and Multi-Object Spectrometer (NICMOS). The work carried out by the Discovery’s crew ensured the HST could operate until the next scheduled servicing in 1999. The mission involved five spacewalks, where the crew used up to 150 different tools or instruments at various stages. Space Shuttle Discovery returned to Earth ten days later after the successful completion of this mission. Includes showcase to display it in with pride.